"Ripe for the Harvest", "I AM Yours-The Entheos Leader", "Rethinking Parish Structures-The Quality Questions", "Taming the Dragon Within Us" and "Outstanding in HIS Field" are presentations that I have developed over my 30 years of Business Consulting, Priesthood and Church Leadership, Congregational Development,Stewardship Consulting and Personal/Leadership Coaching. Each can be applied to your Personal Life, Business, Team or Congregation with supporting Multi-Media Resources and Handouts. RIPE FOR THE HARVEST: 1. Aligns with the Great Commandment & Great Commission of Christ. 2. Incorporates the Vision/Mission of the Local Congregation. 3. Combines Scripture, Theology, Best Business Practices, Stewardship/Leadership Insights, Emotional Intelligence & Multi-Cultural Practices. 4. Is a Practical, Simple Repeatable, Proven Process in Four Stages. 5. Patterns Leaders such as Jethro, Moses, Jesus, St. Paul & Modern Leaders such as Edward Deming, Pareto, Eric Law, Ed Freedman & Peter Steinke. 6. Inclusive of ALL Regardless of Age, Race/Culture, Sexuality, Context or Denomination. 7. Is NOT an Imposed - Preplanned Model of Polity or Ministry Function. 8. DOES Honor Unique Information in each Specific Case & uses it for Planning, Organizing & Creative Action. 9. 98% Success in 43 Cases, 10 States & 4 Denominations. 10. Increases Leadership- Membership Involvement & Overall Morale. 11. Engages Clergy/Laity Giftedness/Passion for Ministry & the Assimilation of New Members. 12. Increases Stewardship Giving & Streamlines Budgetary Need on Cash Flow. 13. Organizes Administrative Structure/Systemic Efficiency. 14. Eases the Facilitation of Change, Remaining Flexible to New Ideas, Demographic Shifts Without Compromising Internal Spiritual Integrity. 15. "Out's" Conflict Issues for Discussion & Facilitates Creative Solutions that Provide HOPE in Times of TRIAL & CHANGE. Learn to tell "Your Story", how events in your life actually are Kairos moments of Grace where God is acting in your life and using "Your Story" to live and be "God's Story". Learn to rewrite your "I Am" statements of life as if you have been "Captured by the Spirit of God!" What does it mean to be "Theo-Centered" and draw upon that strength at your core, to be the person you are called to be in the various roles and relationships you live into during your daily life. 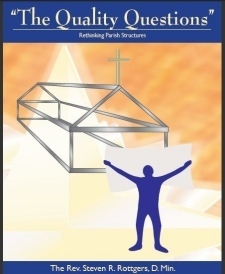 Learn the applications of Quality Theory to Church Organizational Structures and see that Old Testament Leaders such as Jethro and Moses as well as New Testament personalities such as Jesus and St. Paul were using Quality Theory and Best Business Practices and Statistical Analysis in application to Systems Theory far before the Industrial Age and modern times. What are the 7 Deadly Sins of Church Leadership? How do you apply Deming's famous 14 Points of Leadership to Church Leadership practices? What is the Quality Vision and answer to Deming's, "By What Method?" question that played havoc with modern executives of high level corporations? This presentation lowers the high wall that many want to be erected between sacred and secular, however I have yet to meet an executive or church member that has survived a "spiritotomy" You cannot leave your briefcase at your office, on your desk nor can you check your spirituality in the church pew when you leave on Sunday! Take a Journey through the stories of some of the Major Leaders in Scripture who were leaders in their times. How does their Story reveal God's Story? Even more important, How does their story encourage and reveal how God's Story is wanting to be revealed in Your Story Today! Let your meditation of such folk as Abraham, Moses, St. Peter, St. Paul, Mary the Mother of Jesus and Lydia help you discern and listen to God's Call to Leadership in your life! 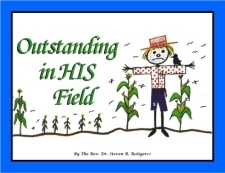 In this parable for all ages, Canton the Scarecrow learns the hard lesson and the difference between Pride and Humility and that Stewardship is not "Ownership" but "Temporary Entrustment by God" This easy story for children also serves as a pointed parable for parents and adults of a better attitude upon which to build your life. If we can learn the same lesson as Canton does during the days between Halloween and Christmas Night, we too can become, "Outstanding in HIS Field! Whether it be your role as a volunteer in a Church ministry, at a local Hospital, or associated with a Civic or Not-for-profit Organization, you are not just a volunteer! Your time, talent, passion, and presence have an impact on who you interact with. You can be the best public ambassador for your group, or their worst public image nightmare! You can add value to your organization by saving budget dollars that would need to be used to replace your efforts, or you can cause unimaginable waste and extra costs by doing your job/role poorly! Whether you know it or not, you are in the role of leader/ambassador and people are watching, making decisions as to the validity and public opinion of the organization you represent by your demeanor, actions, and words you share with strangers. It may be extra time you offer for free. It may be something to fill your time during the day. It may be fulfilling and feel like you are contributing something back to the public community. But You Are Not Just A Volunteer! Learn what that means, and become the best volunteer you can be! Leadership is not about Titles, Status, Power, Uniforms, or the Office with a View and Big Desk! It's about Relationships, Relationships, Relationship, and Relationships! The Important Question is, "With Who?" To answer that sincere and important question you have to know, "Who are You?!" Who you are inside regarding Values, Hopes, Dreams, Vision, and Your Historic Story has a great deal to tell who you are and what makes you tick. After discerning that, the next question arises, "What are you being told, and are You listening to a Passionate Call?" From these points we are drawn into relationships and how we manage ourselves and the connections we have with others makes all the difference between our being perceived as either The Good, The Bad, or The Ugly; in the minds and perceptions of others. If Someone Leads, and Nobody Follows; They're Only Taking a Walk! We each have a three dimensional presence and view of the world around us through 3D lenses. We have Physical Presence, Logical Presence as well as Emotional/Spiritual Presence. We cannot ignore any of these perspectives of life when functioning as Leaders and making crucial decisions that impact our daily life, our work and relationship of those we know and love. Let us help you put on the 3D glasses that are extremely important in a time of extreme and rapid change, when others may be wearing Blinders or Rose-Colored-Glasses. Learn that "Dragon Slaying" today does not take place in caves, on castle walls or to rescue fair maidens! It is a battle that takes place in the depth of our Triune Brain and involves our own ability to create fear and anxiety in our own life. 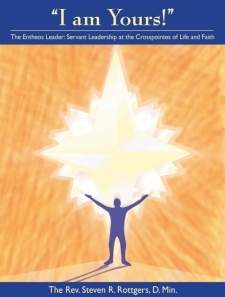 Learn what new and measurable evidence now exists in the field of Emotional Intelligence and Emotional Systems Theory that applies to the critical role of leadership when faced with rapid rates of major change, economic downturns, demographic shifts, and maintaining healthy relationships with peers, staff members, and clients/customers that we interact with on a daily basis. How do you tame the beast that wants to turn you into the reptile you can become, eating your young and anyone that is near you? You can, "Tame the Dragon Within You!" It only takes some time and insight to start the soothing of the beast! I am willing to help you discern how that takes place in your life.